6 actors portray folk artist Bob Dylan at different periods and states of his life. Heath Ledger takes on Dylan as an actor married to a French artist, Cate Blanchet chooses Dylan's surrealist peroid and his rock and roll life style, other depictions include a born again folkie, and quite hilariously Juliane Moore and Kim Gordon as two former folk singers commenting on him. It's a film about the different roles and the complexity of idenity that Dylan represents. Also Fiat of Zassy Diva is gonna play a few songs acoustically. 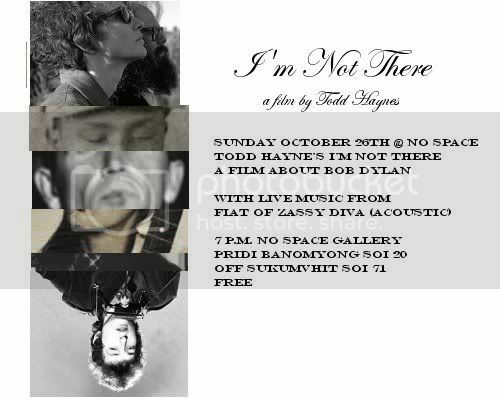 Show is free @ 7 p.m.
"I'm Not There is doggedly pop-modernist in its layered, nonlinear, post–Citizen Kane structure and strategically applied Dylanology. The viewer is invited to search for the author's footnotes as well as the subject's fingerprints. Quotation merges with invention. A tarantula crawls through it. Original recordings mix with covers. The title is made literal by Haynes's subtitle: The Lives and Time of Bob Dylan. The lives are his. The time—however chronologically skewed—is ours. " "Todd Haynes' 'I'm Not There' does something different: In this ambitious and extraordinary dream-world meditation on the idea of Dylan, Haynes shows us Dylan's many faces by literally giving him many faces. We see him as an 11-year-old black kid who goes by the name Woody Guthrie, toting his battered guitar through the countryside; a sensitive, beloved troubadour with the power to motivate clean-cut young men and women in penny loafers and bobbed haircuts to change the world; an outlaw drifting through a semisurreal Western town; a blunt, boorish superstar who makes halfhearted attempts to be a family man; a skinny would-be savior in shades who has been anointed with holy oil and is repulsed by the way it feels on his skin. This is a biopic of an idea, not of a man"